Since 1927, the Harvard Medical Alumni Bulletin has featured doctors� voices on topics ranging from the healing power of music to the neurology of humor. The alumni, faculty, and students of Harvard Medical School write most of the articles, injecting wisdom, grace, and irreverence into the magazine�s pages. 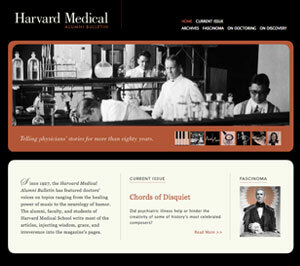 I worked with the Harvard Medical team to concept and translate their award-winning Alumni Bulletin to the web.